products | 美國亞馬遜網購 折扣搜尋平台 天天5折以上商品!! Whether you've recently fallen in love with exercise or have been working out for years, give your knees and joints the support they need with the Sable knee brace support compression sleeve [2 pack]. Made of a mixed-elastic fabric including spandex and nylon, the fda approved knee sleeve features a tight anti-slip design so it stays in place to provide support no matter the physical activity. Wider coverage for even pressure distribution stretching above and below the knee, the extra length provides the stability you need. The evenly distributed weave of the knee brace ensures that your patella, joints, and the surrounding areas get an equal amount of pressure. Extra support for all sports not all sports are equal yet the support band will accommodate all athletes no matter the activity. From physically demanding sports like basketball, football, or weight lifting to seemingly more gentle sports like bowling or table tennis, get the protection you need. Flexible, breathable fabric worn around the knee, the spiral elastic weaving will warm the surrounding muscles helping them to relax. Despite the tightness of the sleeve, the flexible material is still breathable to keep sweating to a minimum. 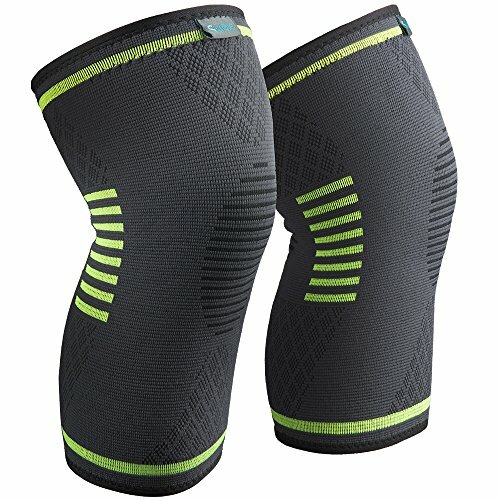 Reduces Stress and Swelling: Tight compression reduces inflammation and helps recovery so you can quickly start exercising again. PLEASE NOTE: 1) they come in pairs; 2)If you're between sizes, choose the lower size for extra compression and upper size for reduced compression ; 3) Hand wash in cold water and air drying.